Cartilaginous choristoma (CC) can be found in the medial portion of the anterior wall of external auditory canal (EAC) appearing as a small white mass. Histologically, it consists of mature hyaline cartilage without neoplastic features. If CC grows or causes other ear symptoms, simple excision could be down. In this report, I present my clinical experience with four patients with CC in the bony EAC and discuss the clinical importance of CC in differential diagnosis. This study approved by the institutional review board of our hospital (No. 2015-12-009). A 9-year-old girl with pneumonia was consulted from pediatric department for a white mass in the left EAC as an incidental finding. Otoscopic examination revealed a round white mass in the anterior wall of EAC [Figure 1]a. For further evaluation, temporal bone computed tomography scan (TB CT) was obtained. There was a 2 mm-sized small mass in the anterior wall of EAC canal just in front of the short process of the malleus without other findings [Figure 2]a. For the diagnosis, the mass was excised by Rosen needle. The mass was quietly easily separated from the EAC wall. The extirpated specimen was a 2 mm × 1 mm-sized well-circumscribed mass [Figure 3]a. Histologically, the mass was formed by mature hyaline cartilage without malignant changes [Figure 3]b. The final diagnosis was CC rather than “chondroma” since these lesions represent tumor-like growth of histologically normal tissue in an abnormal location. Figure 1: (a) Otoscopic examination of the left external auditory canal in a 9-year-old girl shows a flat white mass (2 mm × 1 mm) at the anterior wall of the bony canal just in front of the short process of the malleus. (b) A horny white mass was found in the anterior wall of ear canal just in front of the short process of the malleus in the right ear. (c) Otoscopic examination revealed a horny white mass in the anterior wall of ear canal nearly contact with the short process of the malleus in the left ear. (d) Otoscopic examination revealed a horny white mass in the anterior wall of ear canal just in front of the short process of the malleus in the right ear. Figure 2: (a) Temporal bone computed tomography scan of case 1 shows a 2 mm-sized small mass (arrow) in the anterior wall of external auditory canal just in front of the short process of the malleus (white arrowhead) without other findings. (b) Temporal bone computed tomography of case 2 shows a 2 mm-sized small mass (arrow) in the anterior wall of right external auditory canal just in front of the short process of the malleus (white arrowhead) without other findings. Figure 3: The extirpated specimen of case 1. The 2 mm × 1 mm-sized mass (hematoxylin and eosin stating, a) was formed from mature hyaline cartilage without malignant changes (hematoxylin and eosin stating, b). A 47-year-old woman with left chronic otitis media was visited for operation. During the ear examination, a horny white mass was found in the anterior wall of EAC just in front of the short process of the malleus in the right ear [Figure 1]b. After obtaining the TB CT [Figure 2]b, the mass of right ear was extirpated during the left side mastoidectomy. The extirpated specimen was a 2 mm × 1 mm-sized well-circumscribed mass consisted of hyaline cartilage without malignant changes. Diagnosis was CC. A 24-year-old man visited our department complaining of otalgia and tinnitus in both the ears. 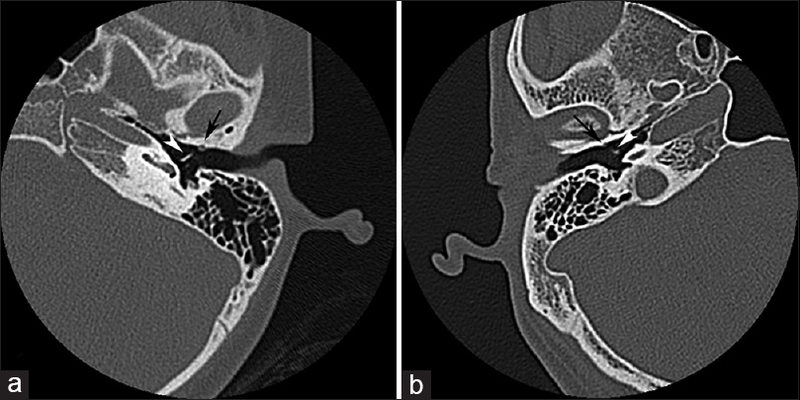 Otoscopic examination revealed a horny white mass in the anterior wall of EAC nearly contact with the short process of the malleus in the left ear [Figure 1]c. Even though the mass wound be not the main cause of complaint, the patient agreed to undergo surgical excision. The mass was quite hard but was easily removed without injuring the tympanic membrane. The extirpated mass was 2 mm-sized well-circumscribed mass consisted of hyaline cartilage without malignant changes. Diagnosis was CC. An 80-year-old woman visited our department complaining of vertigo. Otoscopic examination revealed a horny white mass in the anterior wall of EAC just in front of the short process of the malleus in the right ear [Figure 1]d. Dix-Hallpike test result was consisted with left posterior canal benign paroxysmal positional vertigo. Modified Epley maneuver was performed. The patient decided to keep observation the mass without excision. All patients had an uneventful postoperative course with no postoperative recurrence. The presence of a heterotopic cartilaginous mass in the bony EAC is an unusual and interesting finding. Relatively, little information about this entity has accumulated. However, with heightened awareness, an increasing number of such cases were seen in our department in recent years. It appeared that this lesion was not as rare as it was once thought to be. It is very surprising that the term “chondroma” has been wrongly used to describe “CC” in many previous studies., Doubts exist about the true nature of choristoma. Choristoma is a tumor-like growth of normal tissue occurring in an abnormal location. However, its component has close association in embryological development. Such cartilaginous lesions in the bony EAC could be CC rather than chondromas. Histologically, these lesions were composed of mature hyaline cartilage of normal chondrocytes. None of these lesions had histological features of malignancy. Hence, the diagnosis of CC instead of initial chondromas was finally made. Cartilaginous tissue is not normally found in the bony EAC. Thus, it more fits the definition of a CC. In this series, the term “harmatoma” is recommended neither since it is limited to spontaneous growths composed exclusively of components derived from local tissue. The true nature of CC is still doubtful. Furthermore, the mechanism of the exclusive occurrence in front of the short process and handle of the malleus is not well understood. Embryologically, the malleus and incus form the most proximal (caudal) part of Meckel's cartilage and the malleus remain attached to Meckel's during development, forming a direct connection between mandible and middle ear. The caudal part undergoes endochondrial ossification and forms the malleus and incus. Meckel's cartilage breaks down by the 8th month of gestation. The transformation process to a ligamentous fate such as sphenomandibular and anterior malleolar ligaments start close to the malleus and then toward the dentary. These lesions presented as a single, white, hard, round, horn- or club-shaped mass with a smooth surface, and the size was 1–2 mm in diameter. Most of the lesions were asymptomatic. No progressive enlargement of tumor was observed in nonoperated case. Its neoplastic nature is unreported. When the lesion occurs at the typical site (i.e., the medial portion of the anterior wall of the bony EAC just in front of the short process of the malleus), the differential diagnosis of exostosis and keratoma should be included in the study. Diffuse exostoses are broad-based hyperostotic lesions, usually bilateral and symmetric, and found in patients with a history of frequent participation in aquatic activity. Removal of the asymptomatic CC is not always necessary like other asymptomatic benign mass in EAC  since it is essential features appear to be normal. The frequent cause of extirpation would be a repetitive external otitis or conductive hearing loss by crust or attaching to the short process of malleus. If removal of CC is needed, simple excision offers a solution. They could be easily removed with a Rosen needle or pick. All the lesions were located between the squamous epithelium and periosteum of the bony auditory canal. The lesions were in contact with the periosteum but did not arise from the periosteum without definite erosion of the periosteum of the bony EAC. The presence of a heterotopic cartilaginous mass in the bony external EAC is not as rare as it was once thought to be. The term “CC” rather than “chondroma” nor “harmatoma” may be more appropriate for these lesions. If removal of CC is needed, simple excision can be done. Gyo K, Kawakita S, Kobayashi J, Hakuba N, Matsumoto S. Chondroma of the bony external auditory canal attached to the short process of the malleus. Int J Pediatr Otorhinolaryngol 2004;68:1441-4. Tanigawa T, Inafuku S, Nakayama M. Five cases of chondroma involving the external auditory canal. Auris Nasus Larynx 2008;35:559-61. West CB Jr., Atkins JS Jr. Choristomas of the intraoral soft tissues. Otolaryngol Head Neck Surg 1988;99:528-30. Lee FP. Cartilaginous choristoma of the bony external auditory canal: A study of 36 cases. Otolaryngol Head Neck Surg 2005;133:786-90. Anthwal N, Joshi L, Tucker AS. Evolution of the mammalian middle ear and jaw: Adaptations and novel structures. J Anat 2013;222:147-60. Cheynet F, Guyot L, Richard O, Layoun W, Gola R. Discomallear and malleomandibular ligaments: Anatomical study and clinical applications. Surg Radiol Anat 2003;25:152-7. Fisher EW, McManus TC. Surgery for external auditory canal exostoses and osteomata. J Laryngol Otol 1994;108:106-10.